Today I visited an inspiring family in the small region of Cudlee Creek, nestled within the heart of the Adelaide Hills. It was a stunning winter’s day, with crisp, clear blue skies highlighting the last of the yellow leaves hanging onto the fruit trees, contrasting with the deep green grass on the steep hills surrounding the fertile valleys of their orchard. As I drove along a muddy track past the stone walls and cold stores to the old farm house, I felt an immediate sense of history. Which is really no surprise, as the Hannafords are fifth generation apple growers, who first settled in South Australia in the 1830’s. I met with Carey, who together with her husband Matt and two young boys, despite the long family history of farming, only took up farming seven years ago. I wanted to hear Carey’s story of how she has embraced the farming lifestyle and how she and Matt are now now passionate about growing high quality, premium apples. We settled into our comfortable lounge chairs looking out over the orchard and cradling a warming cup of tea, with the children happily playing in the background, Carey shared with me their story. Matt’s father had retired from the farm some years ago and after it being leased out for several years, it had gradually declined. 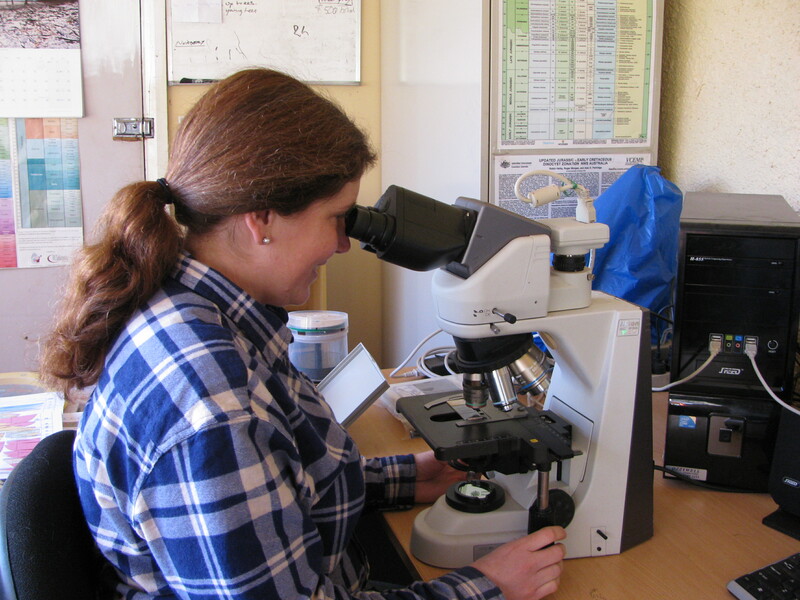 Matt was a qualified mechanic working long hours for little pay and Carey was a successful geologist/palynologist, working in a highly specialised field in the oil and gas industry, using fossils, pollen and microplankton to age rocks and map oil fields. They decided that it was time for them to make a life change and take on the farm. The farm itself consists of 11 hectares of intensive apple orchard and approximately 100 hectares of grazing land and forest. 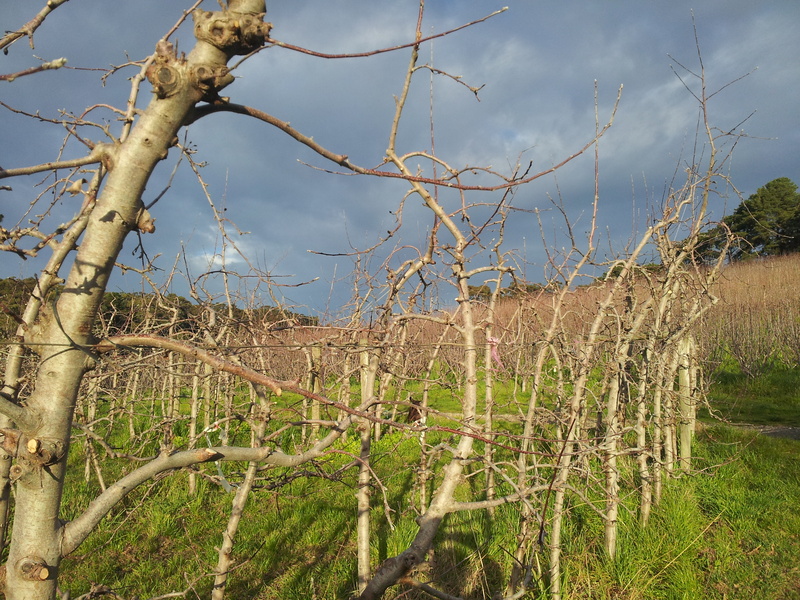 It is one of the last surviving orchards within the Cudlee Creek area, which was once a thriving orchard district. Like many apple growing families, Carey and Matt still draw in an off-farm income, with Carey working part time as a palynologist. This has enabled them to invest heavily in the much-needed upgrading of the orchard and still have a steady income to pay the household bills. We take a pause as the children come in to share their excitement over a great story they had invented, I reflected that I was in the presence of an extremely intelligent woman who is highly skilled in her off-farm work, but who also pours her heart and soul into the farm. The children wander off again to their magical world of imagination and Carey continues. 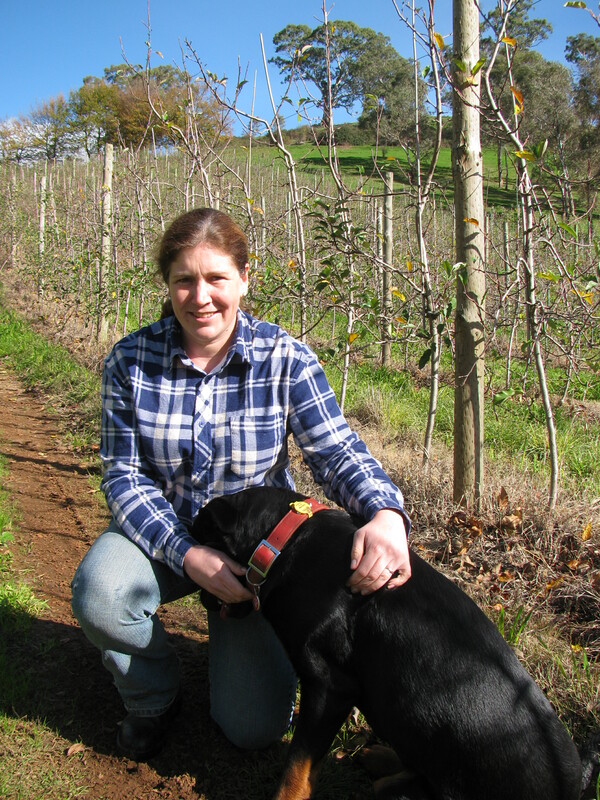 As we wander outside to enjoy some rare winter sunshine in this beautiful part of the world, Carey shares with me “I’m excited to see where the Australian apple industry will go in the future. There have been massive changes in the last 10 years. I would like to think that we can be leaders in a high quality, “greener” product, trustworthy for quality. I think we can really do that well. There is a demand for fruit that is safe and healthy and there is opportunity to capture that market. Apples aren’t going to go away, there will just be different challenges and because of the different wage situations and living costs here, the main way we can succeed is through the better use of technology. Like how Germany has managed to thrive. I think we will still be here in twenty years!”. As I load my children back into the car and negotiate my way back up the muddy track, taking in the beautiful surroundings, I can’t help but think that with families like the Hannafords, our food future is indeed in safe hands! One thing that farmers are often overlooked for is their deep affinity for the land. A farmer has an intrinsic sense of appreciation for the physical landscapes around them and never takes them for granted. I am fortunate to live on an apple orchard and every single day I feel incredibly lucky to be where I am. No matter how stressed or unhappy I may be after a particularly difficult day, a walk around the property has an incredibly calming effect. It never ceases to amaze me how often my breath is taken away by the beauty of my surroundings. Autumn in the heart of apple growing country is in particular a very special time of year. It is the time when the long toils of the year come to fruition, when the fruit ripens and is harvested. It is a hive of activity! Autumn is also when the night temperatures drop, with cold, crisp mornings followed by clear, sunny days. The cool nights and warm sunshine combine to bring out the best possible colours and flavours in the fruit. The cold morning air and hint of frost or dew on the ground takes your breath away when you take the first few steps outside, then invigorates your body. Before long, the sun creeps up over the horizon and gradually warms you through. Then as the sun plummets over the horizon again at the end of the day, so does the temperature, ready to begin the cycle again. 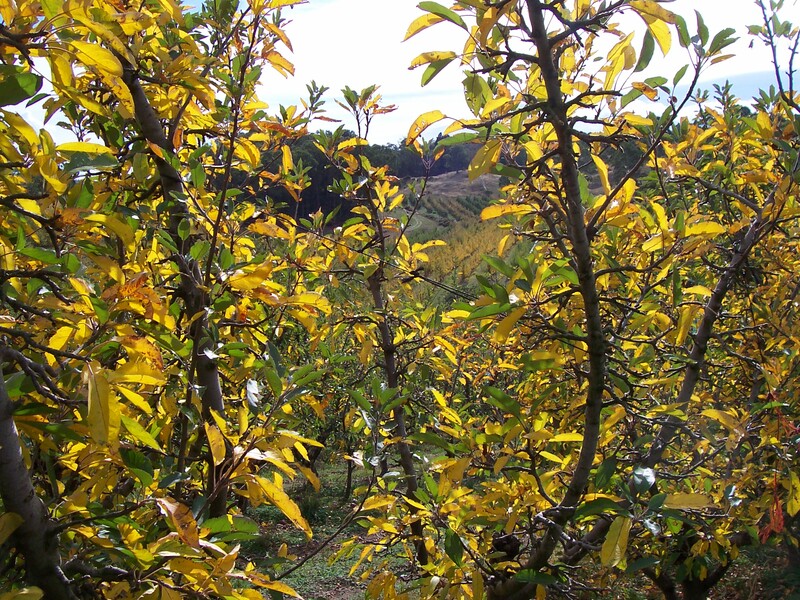 Autumn in an orchard is also a brilliant display of colour, with leaves changing to a kaleidoscope of yellows after the fruit has been harvested. By late afternoon, the dusty air filters the sunshine to a golden yellow, reflecting off the white trunks of the eucalyptus trees and the dry grassy paddocks nearby, contrasting with the deep greens of the orchard grass and the brilliant pinks and reds of the fruit still ripening on the trees. In an apple orchard, Autumn is also characterized by the sweet smell of ripe fruit on the trees and in the cool rooms, and discarded fruit fermenting on the orchard floor. The smells of autumn in an apple orchard are divine! But the greatest joy of all is biting into a crisp, sweet, juicy apple that has been freshly picked from the tree. Savouring the loud crunch resonating through your ears, the intense flavours and magnificent juiciness. 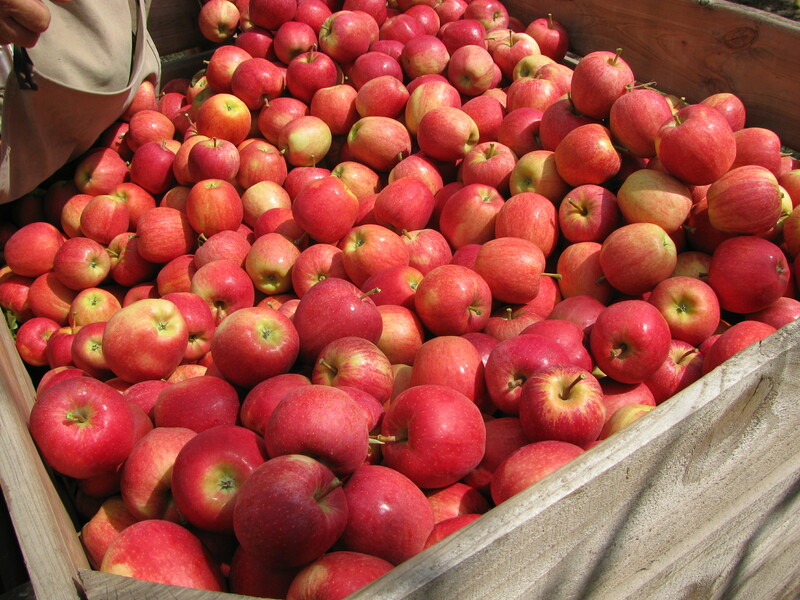 As harvest draws to a close and winter approaches, now is the time where apple growers take stock, review their activities for the year and consider the commercial gains or losses of their enterprise. However it is also a time to pause and be grateful for having the privilege to be caretakers of this amazing corner of the world and to provide fresh, healthy food to our communities.